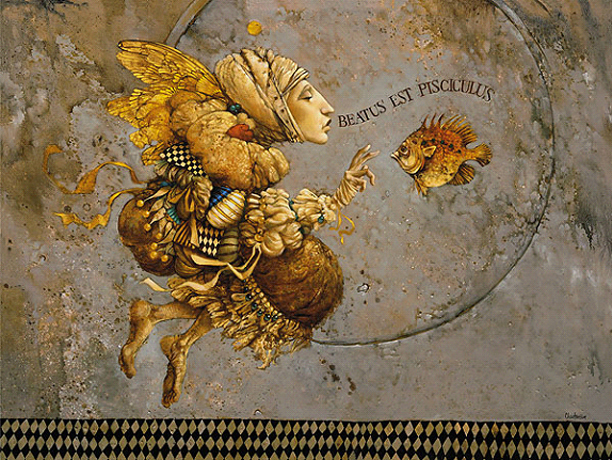 The words coming out of this angel’s mouth are purposely provocative and designed to make you wonder “What does that mean?” It’s Latin, beatus est pisciculus, meaning “Blessed is the little fish.” Floating fish symbolize the magic all around us and they are blessed little things themselves, to bring this magic into our lives. Is the angel blessing the fish or the fish blessing the angel? The fish is a symbol I frequently use and this painting was meant as my “thank-you” for a lot of the magic in my life. Christensen’s original painting is 36 X 48 inches. Our Anniversary Edition is released in two sizes, a very limited quantity at a major-statement size of 40 X 30, and also at 24 x 18 inches. The blessing of Benediction works beautifully at either size.